As you may remember, I ripped apart the last Harry Potter movie that I reviewed (Harry Potter and the Half Blood Prince). Missing my opportunity to see Part 1 in the theatre, I had to jump at my chance to see the finale in the theater. And I'm going to repeat what I tweeted shortly afterward here: This movie is an emotional, amazing and thrilling end to the series. I'm going to not use my usual method of reviewing this movie because of those things. Over eight films we have watched Daniel Radcliffe, Rupert Grint and Emma Watson grow and mature, not only in real life but also in the movies as Harry, Ron, and Hermione. You will get to see parts of the previous movies in flashbacks and their change will be obvious. As the movie tagline says "It all ends". And so it does. Daniel Radcliffe has perfected his role as Harry Potter - just in time for the series to end sadly. It will seem like a broken record but you can feel and see the growth he has had with his character, and the way he is able to express his emotions subtly when he knows what he must do to meet his destiny - it is a far cry from the ending of Goblet of Fire. Rupert Grint and Emma Watson continue their march along their own paths, but this movie is mainly Harry v. Voldemort - Ron and Hermione are mainly along for the ride, and yes they help, but in a different way than usual. Ciaran Hinds (Sum of All Fears, Munich) joins the cast for this final movie, playing Dumbledore's brother Aberforth. While the book goes into more detail about his character, enough information was given coupled with Ciaran's surprising performance - his ability to convey information through his tone has always been a strength of his. We don't get to see that much of Helena Bonham Carter as Bellatrix Lestrange, especially compared to the last few movies, which is kind of disappointing, but she is a minor character in this film. But who steals the show? Ralph Fiennes continues to amaze with his performance of Voldemort, but Voldemort has not had any character growth - but why should he? No, this movie is carried by Alan Rickman. A majority of the flashbacks from the previous movies are during the recalled memory of Severus Snape, and Alan Rickman portrays Snape with a depth we hadn't ever seen before. The most emotional part of the film which is also the true climax will bring tears to your eyes. His performance in this movie alone should be honored in some way, and hopefully it will be. He makes you feel what Severus felt. I've always known that he is a wonderful actor, but he exceeds even my expectations in this movie. The movie is extremely literal to the book, with only a few minor alterations. Yes, there is the occasional comic relief that will make you laugh, but they don't distract from the fact that this movie is dark. After a brief recap of the previous movie, and one short sequence that is necessary, the movie takes off and you have an exciting ride along the journey to the end. Yes there is down time but you will need to catch your breath along the way. And get kleenex for the emotional climax that leads to the end. Like I tweeted, this movie is a fitting end for the series. This is the movie to see this summer, and is the best movie in years. Download Harry Potter and the Deathly Hallows: Part 2 from the iTunes Store in Digial HD. 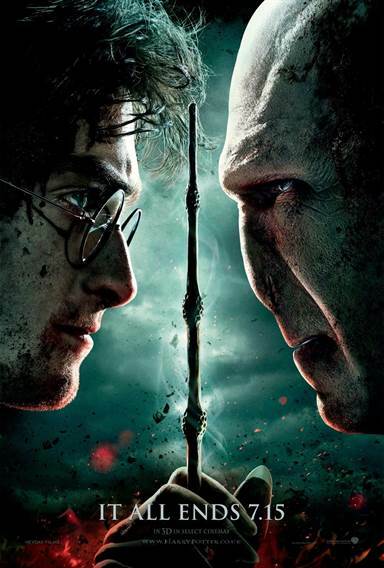 For more information about Harry Potter and the Deathly Hallows: Part 2 visit the FlickDirect Movie Database.